Something Looks Weird In Broward County. Here’s What We Know About A Possible Florida Recount. The Florida U.S. Senate race is still too close to call. According to unofficial results on the Florida Department of State website at 11:45 a.m. Eastern on Friday, Nov. 9, Republican Gov. Rick Scott led Democratic Sen. Bill Nelson by 15,046 votes — or 0.18 percentage points. We’re watching that margin closely because if it stays about that small, it will trigger a recount. It’s already narrowed since election night, when Scott initially declared victory with a 56,000-vote lead. The changing margin is due to continued vote-counting in Broward and Palm Beach counties, two of Florida’s largest and more Democratic-leaning counties. On Thursday evening, the supervisors of elections in the two counties told the South Florida Sun Sentinel that vote counting there was mostly complete. Under Florida law, counties have to report unofficial election results to the secretary of state by Saturday at noon, but Nelson’s campaign is suing to extend that deadline. Scott’s campaign and the National Republican Senatorial Committee are also suing both counties for not disclosing more information about the ongoing count, and Scott called on the Florida Department of Law Enforcement to investigate Broward’s handling of ballots. Unusually, the votes tabulated in Broward County so far exhibit a high rate of something called “undervoting,” or not voting in all the races on the ballot. Countywide, 26,060 fewer votes were cast in the U.S. Senate race than in the governor race.1 Put another way, turnout in the Senate race was 3.7 percent lower than in the gubernatorial race. To put in perspective what an eye-popping number of undervotes that is, more Broward County residents voted for the down-ballot constitutional offices of chief financial officer and state agriculture commissioner than U.S. Senate — an extremely high-profile election in which $181 million was spent. Generally, the higher the elected office, the less likely voters are to skip it on their ballots. Something sure does seem off in Broward County; we just don’t know what yet. One possible reason for the discrepancy is poor ballot design. Broward County ballots listed the U.S. Senate race first, right after the ballot instructions. But that pushed the U.S. Senate race to the far bottom left of the ballot, where voters may have skimmed over it, while the governor’s race appears at the top of the ballot’s center column, immediately to the right of the instructions. Sun Sentinel reporters talked with a ballot expert, who said that some voters may not have noticed the Senate race (perhaps thinking it was just part of the ballot instructions) and started filling out their ballot with the governor race instead. 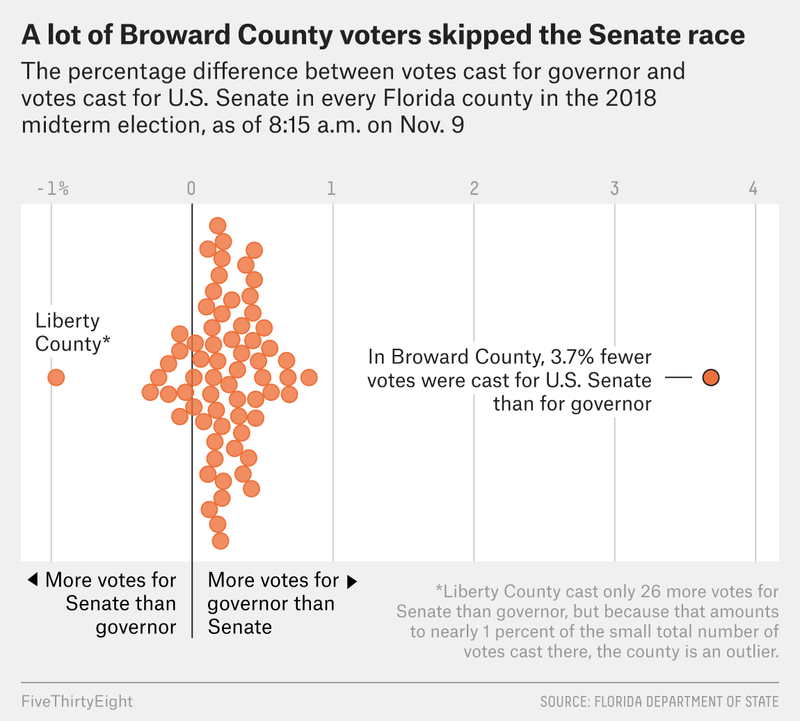 That theory is supported by a data consultant who’s worked for several political campaigns in Florida, who found that the parts of Broward County that fall in the 24th Congressional District did see higher levels of undervoting than other parts of the county. That might be because the 24th District was uncontested, which according to Florida law means that the congressional race did not appear on the ballot at all. As you can see in the sample ballot above, the congressional race would also appear in the lower-left corner on many ballots, along with the Senate race. In districts where there was no congressional race on the ballot, however, that corner would have looked even emptier, perhaps making it easier for voters to inadvertently skip over the Senate race. An alternative explanation is that an error with the vote-tabulating machines in Broward County caused them to sometimes not read people’s votes for U.S. Senate. If that’s true, we would probably only find out if there is a manual recount. According to Florida law, any election that’s within half a percentage point (as this one currently is) triggers a machine recount; then, after the machine recount, if the race is within a quarter of a percentage point, it goes to a much more complex manual recount — a.k.a. each ballot is recounted by hand. As long as the machine recount doesn’t change the Senate results too much (barring a surprise in the remaining ballots in Broward and Palm Beach), it looks like that’s where we’re headed. In addition, Republican former Rep. Ron DeSantis and Democratic Tallahassee Mayor Andrew Gillum are separated by just 0.44 points in the governor’s race, so that could go to a machine recount, too. But recounts rarely change the outcomes of elections. A FairVote analysis found that the average recount from 2000 to 2015 shifted the election margin by an average of just 0.02 percentage points. The largest margin swing was 1,247 votes — coincidentally also coming in Florida, in the 2000 presidential race. If Nelson is going to stage a comeback in the Sunshine State, he’ll almost certainly have to close the gap between him and Scott even more in the next couple of days.